Frankenstein's Monster titled 'Everybody But Me (in the world)'. can I use this for a shirt? Very wicked horror fantasy here with the Galaxy on Frankenstein! Captain Robert Walton: Who are you? The Creature: He never gave me a name. Captain Robert Walton: Why do you weep? The Creature: He was my father. The sadness, sorrow and loneliness are depicted very well on this painting, also the blue and violett colours of the livor mortis are chosen very well. A fine piece of art. Love the detail in this piece and how fluent the colors mesh in together to create that liquid galaxy look. Wow, beautiful poor misunderstood monster! To me he looks very much like I feel sometimes. It's like I can feel his facial expression with my own face. It's perfect. Withdrawn from the world, in deep though, calm yet something is boiling, feeling blue, but there is light and if it's only sparks of hope and optimism. It's like when I feel like nothing's going through me but some bare naked reality for me to ponder at face value without any notable emotions and making of it what I would. I never got into the Frankenstein story much I can't comment much on the monster man himself in relation to your rendering of him other than you made him look very fantastic and relateable. I especially love his forehead. So many good pieces to praise, so I'll go with the horror theme. Love it! I love how you've used a space pattern on him, with that look.. it's almost like as a creature the people judged, he now judges us. Amazing! Your art is so unusual and good, you are very talented. You are a genius Nicky. This picture along with your others are absolutely magnificent. I would love to hang this up in my living room. I think I need a tattoo of this. you're certainly welcome to contact me for a higher resolution image if you'd honestly like to! what have you used to create this topnotch-painting? I have fallen in love with this. 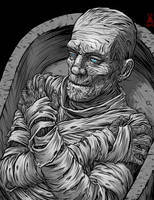 I'm a massive fan of Frankensteins Monster and this is the most beautiful portrayal i've ever seen. Stunning yet beuatifully sad at the same time. I would love this if you ever made a print. You are amazingly talented. I'm so glad and thank you so, so much! That's very kind of you. You're very welcome to message or E-mail me at nickybarkla@live.com if you are still interested in a print and we can make that happen! awesome design, love the colors. This is so rad. Would you be interested in selling this piece? Not the original, but a print maybe? I swear you must have sold your soul to become this talented. This is just brilliant. Your values are absolutely spot on for keeping form and depth so obvious in such a fluid looking style. So unique, love it! Great work with color. Like it. Two of my favorite things. The Creature and the cosmos! Amazingly ood. Nice work, girl! Hat s off for recognizing it as Frankenstein's Moster and not as simply Frankenstein like so many others mistake it to be.